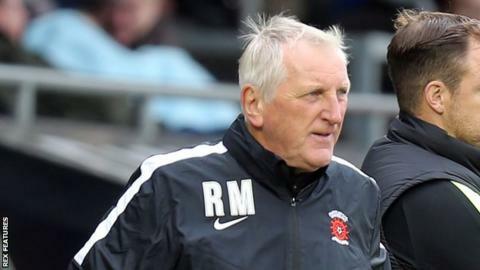 Hartlepool boss Ronnie Moore says his side's extended break might help them in Saturday's FA Cup third-round tie against Championship side Derby. Pools have not played since 19 December after their games with Notts County, Carlisle and Newport were postponed. "It's unusual, missing the Christmas period. I've never had that, only when I'm out of work," Moore told BBC Tees. "Hopefully it's come at the right time, maybe we needed a bit of a break and hopefully we can kick on." Moore said he was unsure how his side, who are without the injured Michael Duckworth and Billy Paynter, would play after almost three weeks without kicking a ball. "We've got a hell of a game against Derby but you won't know, that's the thing about having a rest. We've had one or two injuries so it helped us," he added. Despite going into the tie with a rested squad, Moore insisted there was no pressure to beat a side who are 67 places above them in the Football League. "Nobody expects us to win, so we need to go out and enjoy ourselves without letting ourselves down, that's the big thing," Moore said. "It's always nice and shocks do happen but we've got to believe. They might just underestimate you, but we've got to be top drawer to get anywhere near them."